All cashmere comes from the hair of the cashmere goat, native to the Gobi desert and surrounding plateaus stretching from Northern China to Mongolia. The goat has two types of hair, a rough outer layer which repels the harsh weather, and a fine under-coat which insulates the animals, keeping them warm in freezing conditions. It is this fine hair which is used to make cashmere yarn. Separating these hairs is a time consuming process, traditionally done by hand. 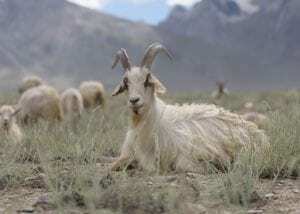 It is this, combined with the relative scarcity of the goats themselves, and the fact that each goat only produces around 150g of cashmere annually, that makes it such an expensive commodity. Luxury Yarns cashmere is made using the finest raw materials selected in Inner Mongolia, home of the very best cashmere. Its extremely fine micronage ensures the final product is as soft as possible. The yarns are then manufactured in Italy, by a company with more than a century of experience, supported by the most up to date technology to preserve the best quality throughout the entire production process. This combined with exclusive Italian creativity for a unique colour range make our yarns the very best cashmere on the market. The manufacturer’s ongoing commitment to sustainability and safety has been recently confirmed by their adherence and inclusion in Greenpeace’s “Detox Catwalk” Campaign which promotes safe, sustainable and non toxic dyes throughout. Last but not least, the yarns are finished specifically for hand knitting and crafting. They are all pre-washed with the utmost care and attention by those who fully understand cashmere fibre and its peculiarities. Crafters are then free to perform their skills and techniques to achieve the best final results with no need for additional finishing. The yarns have minimal pilling and get softer and softer with time. If taken care of your item will last a lifetime and more. Having searched the globe for the perfect yarns, and tried and tested many different cashmere yarns I truly believe that these really are the ultimate Luxury Yarns, both for quality and value and I think you will too. Altopiano hand dyed – as above but hand-dyed in a selection of exclusive colourways. We are always adding to our range so please check back here regularly. If you are interested in becoming a stockist of any of our cashmere yarns please contact me for our wholesale price list and terms.